Drones, both commercial and consumer, try to make sophisticated technologies easy to use. As advanced as drone technology has become, all drones need a little recalibration from time to time to ensure their accuracy. It would be nice if these calibrations could be set once, but things like differing magnetic pulls, a hard landing, and other factors skew the drone’s sensors; in particular the accelerometer and magnetometer. The magnetometer is the compass that guides the drone between cardinal directions as it flies over a field. Since the earth’s magnetic field changes depending on where you are, if you move your drone a large distance (several hundred miles) this will cause the drone to misread its heading and fly a few degrees off its true center, which will decrease flight efficiency and decrease the area of land that can be mapped during the flight. The easiest way to know if your magnetometer is out of whack is to point the front of the drone towards a landmark and then look on Mission Planner to see if the red heading line from the drone’s icon is also pointing at the same landmark. If it is more than a few degrees off, then this is a telltale sign that the compass needs to be re-calibrated. Another give away is if the drone flies like it’s in a “toilet bowl” (flying in circular, swirling movements) while attempting to hold position. Re-calibrate the magnetometer if this behavior crops up. If there are any significant changes to the drone’s hardware, such as adding a larger battery or camera gimbal, the magnetometer should also be recalibrated to compensate for the change. Fortunately, the process takes less than five minutes, so it is not a time-consuming to ensure accurate data (see sidebar). Another sensor that requires regular recalibration is the accelerometer. The accelerometer is responsible for keeping the drone stable and balanced as it flies. If the accelerometer is not properly calibrated, the drone’s flight may become erratic and unsafe. 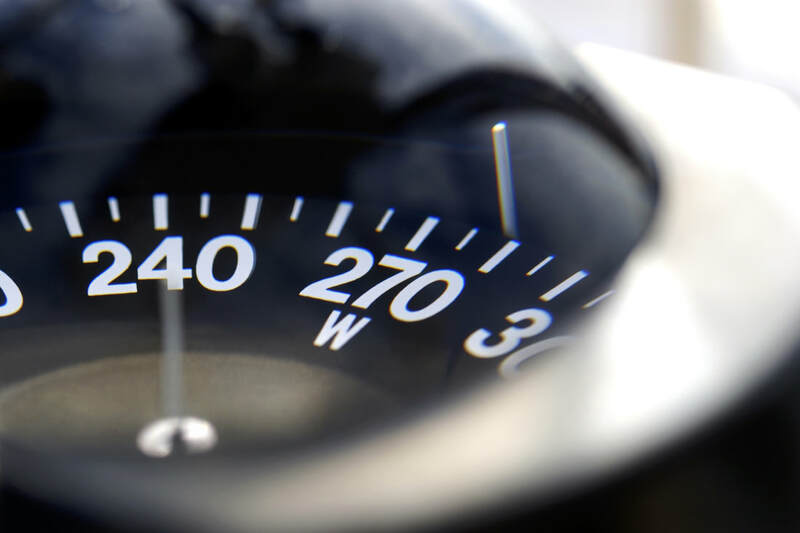 If the artificial horizon on your ground control station is not level while the drone is placed on a level surface, it is time to recalibrate. If your drone drone’s flight seems not-quite-right, its time. This should be done before letting your drone complete a survey. The accelerometer can be influenced by a variety of factors including changes in temperature or any sudden shocks and vibrations during transportation, especially if you are carrying the drone on an airplane. Typically you should recalibrate the accelerometer anytime the drone receives a heavy jolt, or at minimum, every six months or fifty hours of flight time. To recalibrate the magnetometer, it must collect a series of data points so it can correctly orient to the earth’s local magnetic field. Start by opening Mission Planner and select Initial Setup, then Mandatory Hardware, followed by Compass. Make sure the Manual Rotation is set to NO and then select Live Calibration. When in Live Calibration, it will ask you to rotate the drone in circular motions. This allows for the GPS module to read the gravitational pull at your location. As you revolve the drone in your hands, make sure to differentiate your rotation to collect a more diverse array of data points surrounding the drone. As you do this, the image on Mission Planner will light up with every data point you’ve collected and start to build a ball of data points surrounding your drone’s center. You must fill in the points that are shown on the mission planner. We recommend that once you have that complete, you continue to rotate the device until you have three hundred additional data points. This may seem daunting, but every second it collects another data point so the process should only take five minutes. Open up Mission Planner, select Initial Setup, then Mandatory Hardware, followed by Accel Calibration. It will guide you through the process asking you to hold the drone level on it’s supports, then lean it on it’s left side, then it’s right side, then angle it nose down, then nose up, and finally rotate it on its back so the belly of the drone is facing the sky. ​The Accel Calibration will guide you through the entire process and signal at each step. Once completed, your accelerometer will read a correct artificial horizon when level. Repair service is now available @ $50 USD per billable hour plu parts. All warranties extended from manufacture.